When you see an interior that just 'hits' you it truly is a magical moment for those of us that love design. 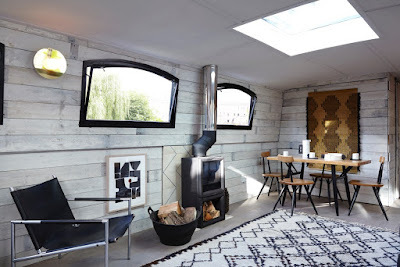 Today this inskpiring interior did just that and... it's a barge. This is a beautifully refurbished barge in Hackney London and with its cool Scandi vibe, contemporary ceramics and Moroccan textures & patterns it really ticks many boxes. I can certainly see all these elements sitting perfectly in a beach house or surf shack. Congrats on the innovative and inspiring concept. Bravo. Elle of a holiday home!